At CPR Educators, we take pride in being the leading center in Richmond, VA for CPR certification, first aid and AED instruction. Our instructors are experienced and certified in teaching, and many have an extensive background in providing emergency services professionally, including nurses, EMTs, firefighters, and physicians. Our instructors are able to teach the information in a way that makes it practical and accessible for real-world application. Why Take CPR Classes in Richmond? Unfortunately, most people don’t think about first aid or CPR unless they need it for a job requirement or legal reason, such as having a child care license. However, the number one reason to register for CPR classes is simple: CPR certification and first aid saves lives. Even though most of us will never have to use these skills, knowing what to do in an emergency can stop a “worst-case scenario.” CPR and first aid skills can keep victims of heart attack, car accidents, and even drowning alive until first responders arrive. This is why we are so dedicated to making sure our students are empowered to feel confident in their skills. We want them to have the practical know-how to take action in a worst-case scenario. We are proud to be an American Heart Association Authorized Training Center in Richmond. As part of our commitment to educating others in life-saving skills, we offer several emergency training courses including AED training, CPR training, and pediatric CPR classes. This course is intended for child care workers and to meet the legal requirements for daycare facilities. However, this class is also highly recommended for parents, babysitters, and anyone who cares for children personally or professionally. This course teaches healthcare workers, including CNAs, LPNs, caregivers for disabled people, and first responders, how to administer CPR and cardiovascular life support both in one-person and two-person teams and in healthcare and pre-hospital locations. The material in this course is identical to what’s taught in Basic Life Support class. However, the information is taught online for students who prefer a self-paced study experience, while the practical, hands-on training section along with the certification exam are administered at our Richmond training facility. This class prepares students to appropriately act and react to blood and bodily fluids to prevent the spread of bloodborne pathogens. This class complies with OSHA Standard 1910.1030. Students learn how to appropriately and effectively operate a fire extinguisher and eliminate small fires in the workplace. This course meets requirements of OSHA 29 CFR 1910.157. We give several first aid and CPR classes throughout the month at our Richmond training facility. Registration is convenient and there are class times that work with any schedule. We cap enrollment at low numbers in order to make sure every student receives personalized instruction while maintaining an enjoyable, stress-free environment. 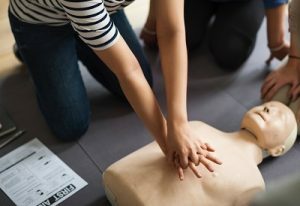 We are also happy to provide on-site CPR classes to businesses and organizations who are seeking a convenient and cost-effective way for their team to meet OSHA requirements and maintain their first aid and CPR certifications. Your team still receives the same in-depth instruction and training we provide in our center, and we can also adapt the class to be more focused toward your industry, especially daycare centers and dental offices.